Look at the blurry thing in the sky. I am not sure what we caught in this image. I posted the image taken only a second before this photo so you can see the progression from frame to frame. I am not sure if this is a UFO or something else. Thought it was interesting because it kind of resembles an airplane. Odd that it is only found in one frame of the beach photos. Notice the wake on the boat for timing and also the person drinking from a glass on the right. 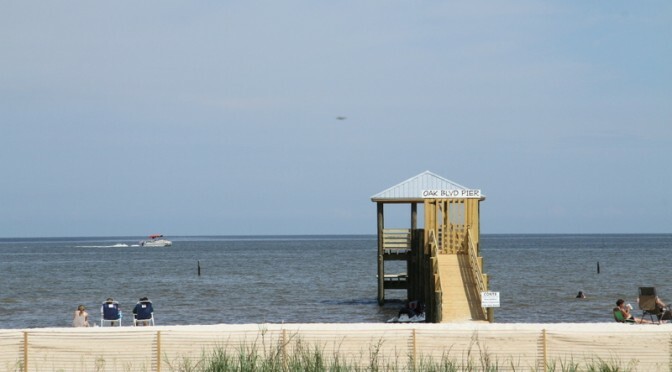 Notice the blur in the sky, is this a UFO off the Mississippi Gulf Coast? We are ready for New Years on the Mississippi Gulf Coast. The sun is setting on 2011 and we are sailing into 2012. We are really looking forward to all the New Year will bring. Visit Coastal90 during the year for more information on Mississippi Coastal Happenings. The weather on the Mississippi Gulf coast is just beautiful. Bay St Louis is enjoying this gift from mother nature. Al Jensen over at Serious Bread has this fall like morning wafting the smell of fresh baked scones to listening noses. What a great place, what a great day. All we need now is the train to pass by to make this really fell like Old Town Bay St. Louis. Have a great weekend! Waveland Pier is a fishing masterpiece! We are members of the Waveland pier. What an amazing deal. One low fee for using a secure well lit fishing pier that has bathrooms. Yes, I said B-A-T-H-R-O-O-M-S. We have fished the pier on many nights. The catch is varied ranging from sharks to crabs. Heck you might even catch some offshore fish in Waveland's waters.